I’m about a year and a half away from the big 3-oh-no! It’s a bit crazy how quickly time seems to fly isn’t it? That said, I’ve been reflecting a bit on things lately and I feel like now is a good time to talk about the personal finance journey that I’ve experienced thus far and also discuss where I want to find myself in the future. This is going to span at least a couple of posts, so check back soon for the epic conclusion! I’ve always been a bit of a capitalist. I like to find ways to earn money by providing a service that other people want, or need. The earliest example of this that I can recall isn’t necessarily very ethical, but it is pretty funny to remember. When I was younger I’d get an occasional allowance from my parents after doing chores. My younger brother was pretty good about hanging on to his allowance for more than 30 minutes, unlike me. In fact he’d quite often have cash on hand because even if he did spend some of his money, he wouldn’t spend it all at once. Me on the other hand… it was spent before it even left my parents hands and got into mine. My brother used to lose his wallet all of the time, it drove me nuts because he’d usually have cash in it when he lost it. Here I was without any money (and a tummy ache from eating too much candy) and my brother was wasting his money by losing it. It was infuriating! Frustrations aside, he continued to lose it over, and over, and over, and over. So I came up with a brilliant idea. I’d charge my brother to help him find his wallet. Seems pretty kosher right? Yeah, I guess it would be, if I just helped him find it when he lost it. That’s not what happened though. I needed money to get more candy or basketball cards (who can remember?) 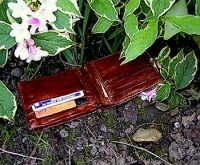 but he hadn’t lost his wallet for a few days. I helped speed the process along. As soon as my brother realized his wallet was missing he figured he had lost it. Then I offered to help him find it, for a fee. He agreed and so after a few minutes of looking around I slowly made my way towards the neighbors house and retrieved the wallet for my brother. He was happy, I was happy. Until I gave myself another stomach ache. Oh well, such is life. The point of this story is to highlight that I have always been a bit of a spender. Money burns a hole in my pocket. I also want to point out that I started my personal finance journey out on the wrong side of the tracks. My first job was working for a national pizza chain. I started out making the pizzas and eventually took on cash register/phone duties as well. It was around this time that I was really getting into computers and I decided I wanted to get my own. So I started to save a portion of my paycheck. After a few months I had enough to buy the parts to build myself a PC (I did some research and figured I could build one for less than a comparable purchase would cost). This was my first attempt at actually saving some of my money instead of spending it all the second I got it in my grubby little hands. I learned a valuable lesson that summer: If I want something badly enough I’ll be able to overcome my desire to spend all of my money as quickly as I can make it. If I want something badly enough I’ll be able to have the discipline to save for it. I also learned that it feels really, really good to work hard and save your money until you have enough to buy something you want. Eventually I quit the pizza job. For my second job I found myself working for Krispy Kreme, which was an on again/off again relationship, throughout my sophomore and junior years. I continued to spend most of my money whenever I got paid, but I also found things that I wanted to save for and continued to practice saving money so I could get random crap that I probably didn’t really need.While I learned to save, my goals were always very short-sighted. I didn’t think much about the future, but then I don’t know if many teenagers do. I didn’t learn much about personal finance while I was in school. There were no money classes in high school and even if there were I doubt I’d have taken them. I learned some from my parents. They were pretty good about not using credit cards and only buying what they could afford. I remember learning about my Dad’s 401k and I remember being curious about it. That was about the extent of my education though. The really important lessons I learned later on, in my early 20′s. That’s it for today. Check back tomorrow for part 2! I’d love to hear about your early years and what lessons you learned as well, so please leave your comments below!